Building in winter months may bring to mind images of tradesmen shuddering under sub zero conditions and falling behind building schedules. In reality, though, perceptions and technology have improved so much over the years that building in winter is now being embraced more, as people find ways to make it a success. 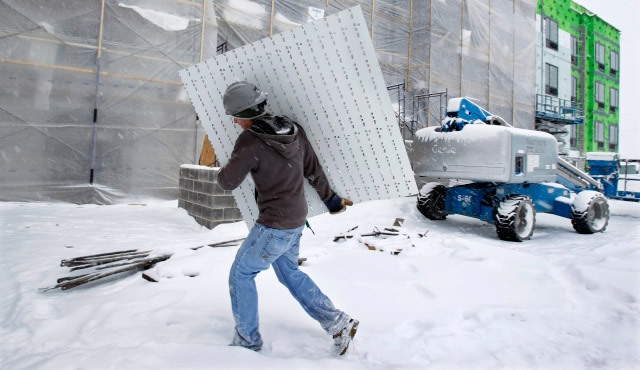 It is well known within the building industry that there is less work for builders and contractors during winter. This is because of perceptions about the winter months and people not wanting to build their homes during winter. What this means for you is that you will have many more tradesmen available to choose from during winter than you would in warmer months. When it comes to building your home, this is one advantage you really cannot overlook. You have a greater chance of negotiating a good deal since supply will be higher than demand for tradesmen, thereby saving on costs. There is also some peace of mind from the knowledge that your chosen builder is unlikely to be straddling many other projects at the same time, so they won’t miss your completion deadlines. Sun and construction seems to go hand in hand, so it’s no surprise when the days gets shorter and breeze gets colder, many people tend to hang their building gloves up for the following winter months. Taking this into consideration, you are likely to get your planning permissions quicker than during the summer months, since there are less people applying to build in winter. Like all things in life, planning is the key to success. Building in the winter means your home will be ready in the spring and you can relax and enjoy your new home in the summer, instead of missing out on the gorgeous sunshine because you will be working on a new home. Fortunately, most building merchants are open all year round and you can always pick up supplies suitable for all seasons and occasions.